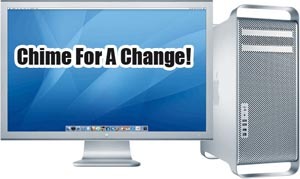 kidnepro.com » Blog Archive » Apple Startup Chime – Time For a Change? Apple Startup Chime – Time For a Change? I don’t know exactly why, but lately the sound of my Mac’s startup chime is really starting to bother me. I recently bought a new Imac and Macbook Pro and while they are two of the most beautifully designed machines on the market today, with all the most innovative new features one could ask for, they still had that same old chime when starting up that I’ve been hearing since I bought my old Mac Quadra back in the early 90’s. I know it’s not a big deal, but maybe it might be a good idea for Apple to update the sound to a more 21st century sound that would better suit their new product line. After all, when I hear that chime, I think I’m back at a time when the first George Bush was president! Now I have nothing against Jim Reekes and his classic chime. It has certainly served us well through the years. However, I just thought that maybe it’s time for a change. How about something like THIS or THIS ? OK..OK..just kidding. I know Steve Jobs would never go for that. Besides, that would get old very quickly. But seriously, maybe something like THIS or THIS would go over well. They are couple of ringtones that I created awhile back which I think might work. I’m sure someone out there can come up with something better. Maybe some sort of contest to pick a new start up chime would be a good idea. I know there are many creative musicians and sound designers that could come up with a bunch of cool choices for Steve and the gang at Apple to choose from. What do you think? Good idea? Want to participate? We can’t guarantee that Apple will even consider changing the chime (this is our wacky idea) and there are not even any cool prizes, but we thought that it might be fun anyway. Send your chime to us “HERE”. Obviously it has to be something very short. 2-3 seconds max, so try and keep your creations in that ballpark. After we get a bunch we will post them online and who knows what will happen. Maybe your original chime will be used in the next generation of Mac’s to hit the market! Great idea! I was getting tired of that old chime myself. Did not know about the wavestation. Thanks for the bit of trivia. Yeah, that chime was old ten years ago. Time for a change! Loose the chime! I just sent you one of my tones.